Is it true? Is fall here at last? In any case, ‘Butterpat’ chrysanthemum is ready! Since we’re finally around the heat bend, it’s time to plant. This week Daphne explains why we should firm the soil around our plants. Why is that, when we’re cautioned not to trample beds? Plus, get her answer on what happens when we till. I did firm the soil around my new snake herb (Dyschoriste linearis), one that accepts my east Austin soil, but is adaptable to many sites. Find out about this drought-tough groundcover and many more when Tom meets with Michelle Pfluger from Green ‘n Growing in Pflugerville. Yep, she descends from the Pfluger founders. Her parents started this great nursery in 1975, one of the first to carry organic products. I cut some of my early teeth on it. Now she’s at the helm, and carrying on the tradition of propagating some of their diverse, Texas-proven selections. She responds to one of CTG’s top questions: How can we dress up dry shade to part sun? One of her drought-tough picks is cobweb plant (Tradescantia sillamontana). Now, this one’s really supposed to get some shade, but I planted my passalong from gardener Paul Lofton last spring in a psycho hot area: shade morning and blasted heat in the afternoon. It blooms most in fall, but its creeping texture is what I treasure. It goes dormant in winter when tall spring spiderworts (Tradescantia gigantea) will take over. This picture shows it in perspective. It’s the one cozying up between the two pots. Another dry shade/part sun lover is Mexican spiderwort (Tinantia pringlei), blooming through hot months. This perennial will go dormant in winter but return in spring, maybe even with a new family! Here’s mine with Yucca rupicola x pallida and fall-blooming bulb Sternbergia lutea. A compatible companion for its spotted leaves is African hosta (Drimiopsis maculata). In gardens, it goes dormant in winter to return in spring. In protected containers, it is evergreen. Nearby are two ‘Helen von Stein’ lamb’s ears. Behind are the ‘Butterpat’ mums. Yellow, silver, and burgundy; lovely! One of the new snake herbs is just down the line from them. Pictures later! I plan to take a cue from Amanda and create a “spotted garden” in this area, too. An evergreen I’ve wanted for years is Mountain pea (Orbexilum sp.) Recently, this drought-hardy plant for sun to part shade has become more available. It’s showing up in gardens all over, including mine. It’s the perfect, no-care addition under big trees, though I’ve also seen it as a lush companion plant in sun. Gets about a foot high. Here’s one with its sweet little pea-flower in the Travis County AgriLife Extension demo garden. Get Michelle’s complete CTG list to spark up your shade. 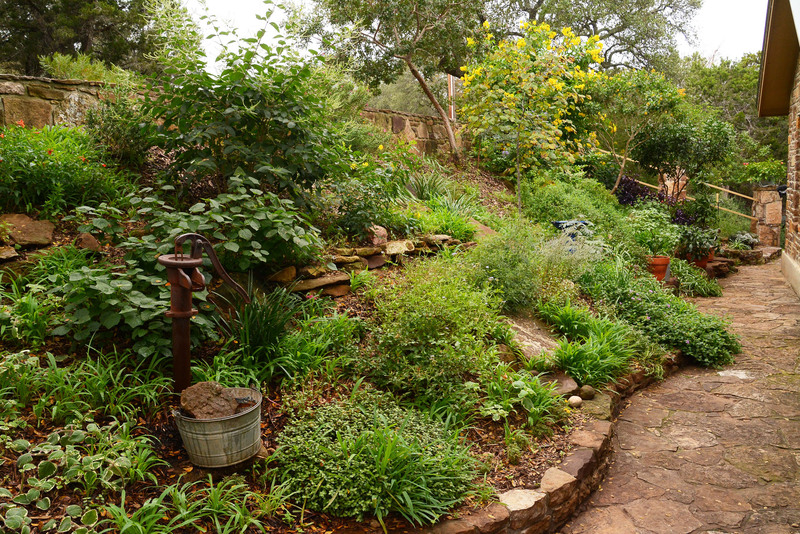 Since drought and hard freezes will always be on our radar, we repeat Merredith Jiles’ Backyard Basics tips on what takes the trauma in his garden. On tour, find soulful inspiration as we head into the season of thanks through Elayne Lansford’s healing garden. Her Bottle World is a tribute to triumph over life-threatening illness and the power of healing through gardening and hands-on creativity. Here’s a shot where director Ed Fuentes documents her journey. Re-framing her reality by giving new life to old objects helped her when husband John Villanacci faced a random disease and double lung transplant, soon after she recovered from breast cancer. One soothing technique is a waterfall from a recycled table top. She even learned how to weld to create her own Bottle World creations from foundlings. Every roadside discard captures her imagination, like this comfy hideaway under a satellite dish. Her story of struggle and yes, celebration, is CTG’s tribute to every gardener who seeks consolation, strength, and joy when life throws us a curve. ← How does a garden grow?